They say that first impressions count for an awful lot and that is certainly true of intros to chord melody pieces. Here, it is your job to set the scene for the piece you are about to play: create the proper atmosphere and draw your audience in to the main body of the song. It’s a time when you can be at your most creative, too: imagine -you’ve got at least eight bars in which you can let your creativity run riot! If you take a listen to some of the songs written during the 30s and 40s, it was common practice to have a fairly long introduction before the refrain. Now, it tends to be just the refrain that we know, the introductions having fallen into disuse – a shame, in my opinion. However, if you check out some of the Ella Fitzgerald recordings of Gershwin, you’ll be surprised to hear how very familiar tunes have quite startlingly unfamiliar introductions. Check out songs like ‘I Got Rhythm’ or ‘A Foggy Day’ and you’ll see what I mean. So, by offering our audience a jazz intro to a familiar tune, we are keeping up a long­standing tradition – despite the fact that we might not be playing the composer’s original idea. How, then, do we go about ‘inventing’ an introduction? Well, there are no rules: you don’t have to start in the same key as the song you’re about to play – in fact, it’s probably as well that you don’t. Keep the audience guessing until they hear those first familiar melody notes. Sometimes, the simple ploy of repeating an idea at various places on the fretboard can have the desired effect – try it, I think you’ll see what I mean. We’ve recorded three different intros: the first leads you into the guitar-friendly key of C major, the second into D and the third into A. Note how they all seem to ‘fall’ into these keys quite naturally, despite all of them seeming to start quite a long way off. I’ve developed each jazz intro to be almost self-contained: they’ve each got their own independent melodic and harmonic ideas which act as portals through which the tunes that they will finally lead into can naturally appear. 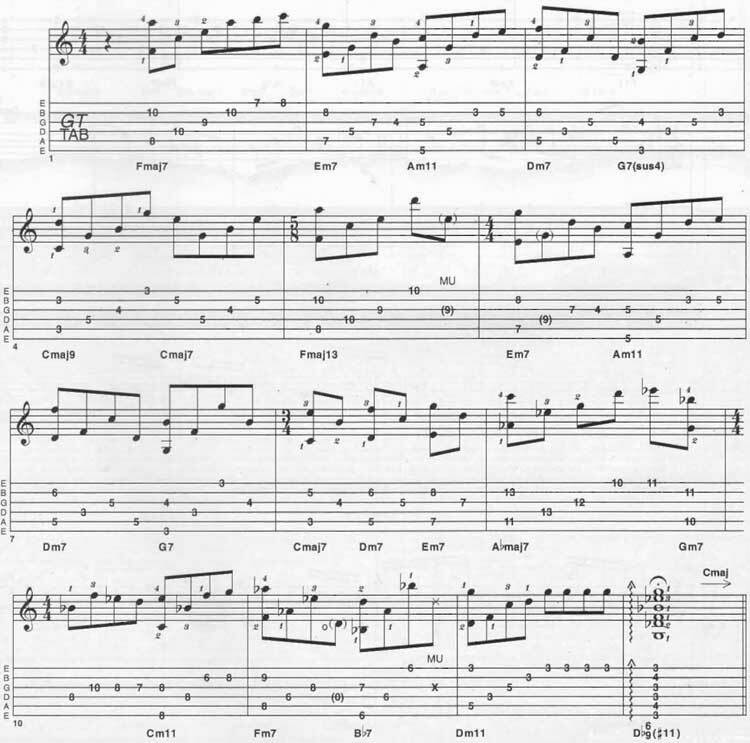 Each of the three intros are heavily arpeggiated and rely on established fingerstyle technique – something which needs developing independently by practice. It really is better that you come to these pieces with your fingerstyle technique pretty much already intact and just use them to buff it up a little! You’ll find over time that these intros will fit a large number of tunes – I think you’ll be surprised at exactly how many – but you can use them as a springboard for your own ideas. Try coming up with a few simple intros of your own, I can confidently say that it will add that extra dash of style to your guitar compositions. It’s a part of Introduce Yourself. Jazz Openings guitar lesson. © 2012 - 2019 TabsClub Powered by TabsClub 42 queries in 0.277 seconds.